The custom printmaking services that I utilized for this year’s competition prints was provided by TransImage, located in Kettering, Ohio. The 2009 annual convention of PPO was the first time that I had entered the very competitive, juried print competition and public exhibition. Six prints were entered. All were selected for the public show, with three Honorable Mentions and three Awards of Achievement. And just a heads-up. I will be presenting two, full-day workshops at Cox Arboretum, the first on Saturday, April 10th and the second on Saturday, May 29th. Both will emphasize macro nature photography in the garden. The April 10th program is currently full (I cap the class at 25 total attendees), but there is a short wait list. I almost always have cancellations when I send-out the pre-session reminder, about a week prior to the workshop. The workshop scheduled for May 29th currently has 12 registered attendees, so there are still plenty of open seats for that program. If you’d like to register, or be added to a wait list, please call me at 937-432-6711 or email. The fee for each workshop is $89 per person, payable on the day of the workshop. Lunch is included. I will also be participating in Orvis Days on Saturday, May 8, 2010 at The Orvis Store near the Dayton Mall. During the day I will be presenting prints of my work as well as providing some basic tips on nature and landscape photography. Yesterday I had the pleasure of visiting a local office where prints of my work are on display within the client waiting area. 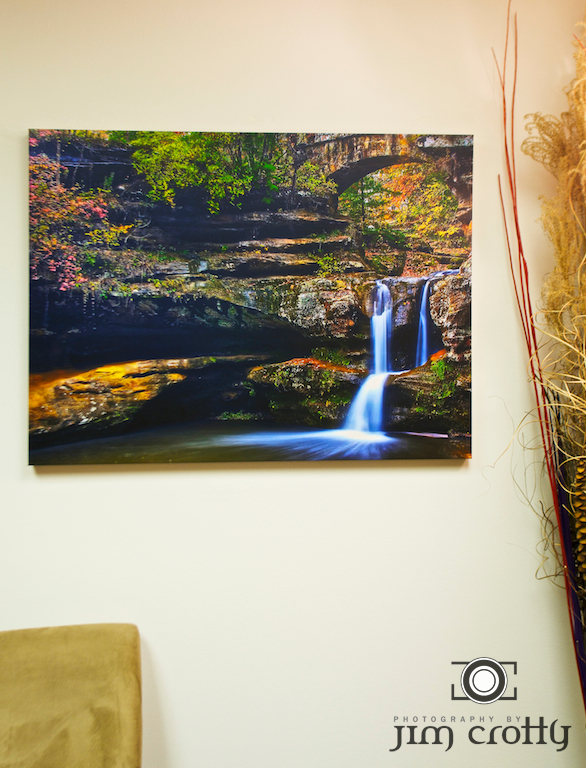 The most recent addition to the collection is a 30″x40″ gallery wrap canvas print of Upper Falls in Hocking Hills, Ohio. 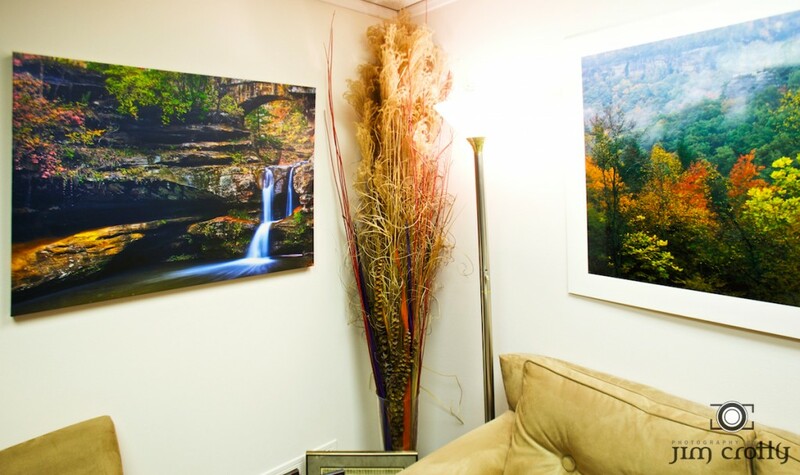 Next to it is an older print, simply displayed on white mount board, of an autumn landscape from Red River Gorge, Kentucky. Both of these prints show how fine art photography can effectively be displayed without a traditional frame. 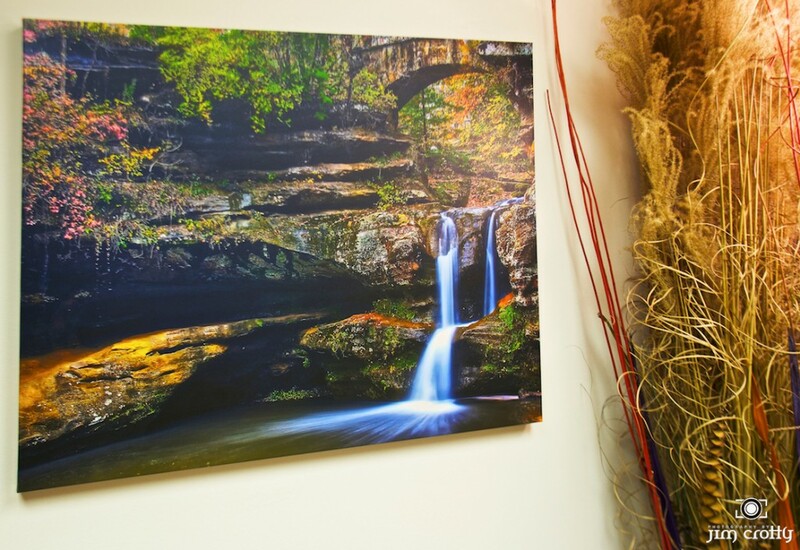 In my home I have 13 of the 30″x40″ gallery wrap canvas prints of some of my favorite photographs captured in Hocking Hils, Cuyahoga Valley, Dayton, Zion National Park of Utah and the Upper Peninsula of Michigan. By all means I’m not against traditional framing. In fact when done professionally the frame in of itself can be a work of art. I just believe in providing customers who look to buy prints of my photography with as many options as possible when it comes to hanging and displaying large format prints. The gallery wrap canvas print is an option that I wish more people would consider. It is ideal for an environment where there are neutral walls and where the print can be fairly safe from wandering hands. These prints come direct to the customer from my professional lab, wired and ready for display. For their size they are very light and easy to hang. These prints also provide that added dimension, hence, the “wrap,” that gives the pleasing effect of almost walking the eye “around” the photograph. For more information regarding sizes and prices, please email or all 1-877-JCrotty (527-6889). Special pricing is available for decorators and commercial art representatives. The rule of four. 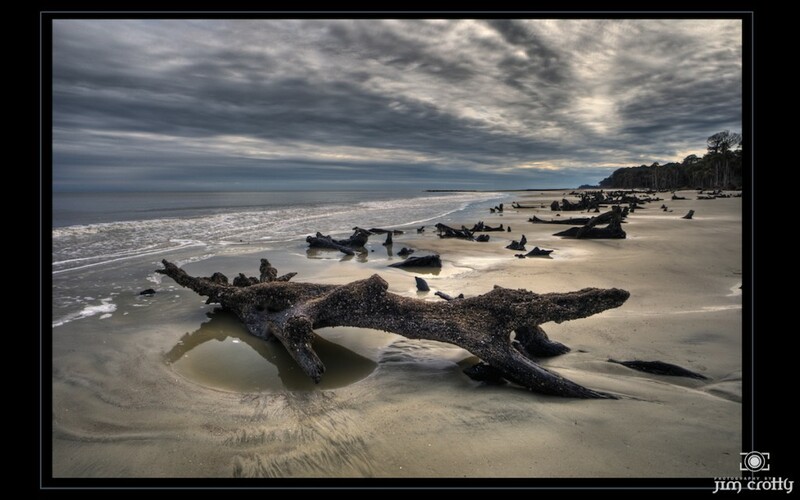 Selecting just four photographs that best represent my artistic vision of a particular location. That’s what I had in mind in the creation of four image poster prints. 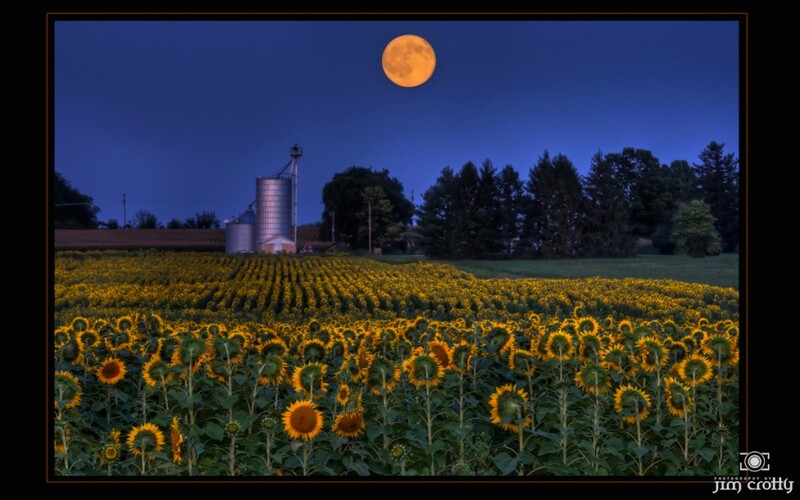 Fine art nature and landscape photography that I’ve taken in locations such as Dayton, Hocking Hills, New Mexico, The Smokies and more. Each of these four image poster prints are now available for online purchase on my Imagekind storefront. Customers are presented a variety of options including print size, frames and paper. Imagekind does an exceptional job in both print quality and packaging (see YouTube video with this post), and the prices are VERY reasonable. I’ll be adding even more selections to the four image poster print storefront in the weeks to come, including my photography of Zion and Glacier National Parks.